60 year old came for routine exam. Her right eye has this appearance. What is this condition associated with ? Do you want to follow up this patient periodically and if so for what reason? 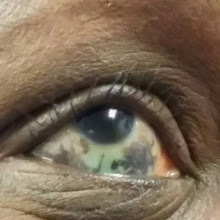 This patient has pigmentation involving the lower lid, conjunctiva and sclera. Nevus of Ota( Oculodermal melanocytosis) has increased risk of glaucoma and less commonly malignant melanoma and hence should be followed up at least once year (if not every 6 months).